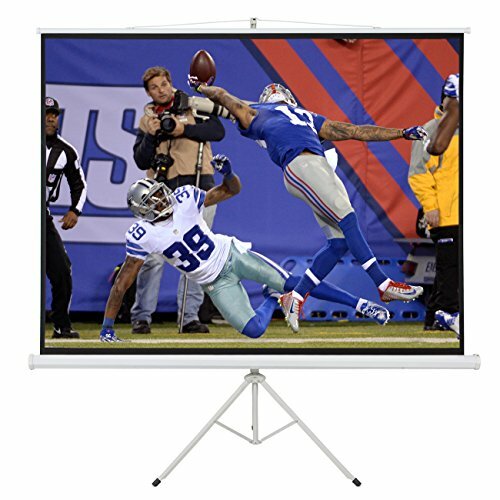 The 80" x 60" tripod portable projector screen! The tripod projector projection is ideal for home theater movies, classroom training, conference room presentations, public display, etc. high quality matte white surface provides 80" x 60" of viewing area with 4:3 aspect ratio and black masked borders to provide a sharp, clear picture. The durable matte white surface is the premier choice when ambient light is controllable. It diffuses projected light uniformly, and you will find a perfect visual enjoyment with optimal image and color reproduction. Height adjustable stand of 67"-120"
Viewing Area (W X H): 80" x 60"